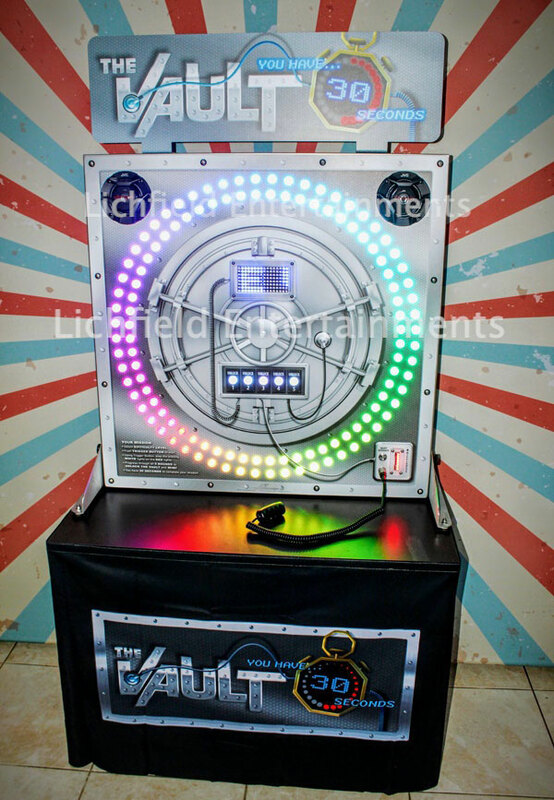 The Vault is a brand new addition for 2019 and this versatile game is perfect for so many types of event it's bound to prove very popular: as an Escape Room game, as an attraction to draw people on to your exhibition stand, a game for conference break-out time, or side entertainment for an evening event. The Vault will test your reaction and eye to hand coordination skills with the challenge being to unlock The Vault within a 30 second time limit. Using a handheld trigger switch you have to stop the orbiting white light in a red zone. Each time you successfully stop the light in a red segment you pass through to the next round, successfully pass through five rounds within the 30 seconds and you 'open the vault' and win! It sounds simple...but in each round the orbiting white light gets quicker and quicker, and the red zones get fewer and smaller! This game is frustratingly addictive and always has a queue of willing participants wanting to test their skills. The game can be set to run in four different difficulty levels so is suitable for all player ages. When being used just as fun game you can set it on the easier levels. If it's being used with a prize for winners then you can set it to run in the more challenging difficulty levels. This game can be hired for anything from a few hours to a few days - or more. It can be supplied with a friendly staff member or unstaffed for you to run yourself although we'll still deliver and install the game for you. The game requires an overall operating area of 4x4ft and access to a mains electric socket is required. 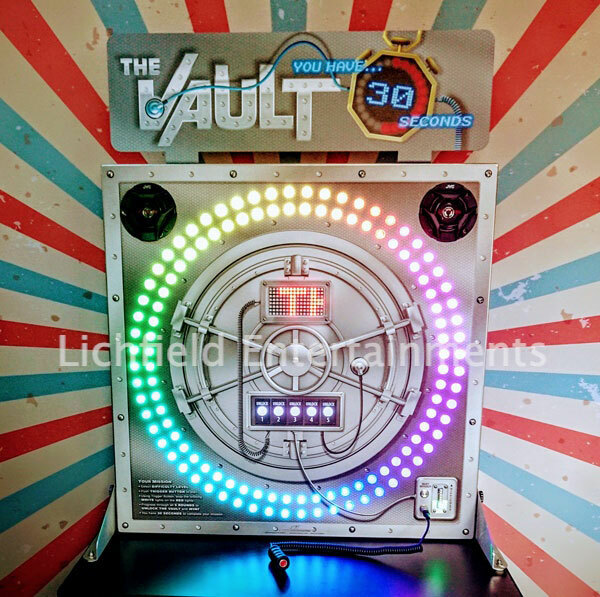 The Vault is the fourth co-ordination and reaction speed game that we've added to our range to go alongside Light Chaser, the brilliant Batak Lite, and the two player head-to-head Strike a Light'. The Vault, as well as our other three reaction games, are perfect for all types of event whether as an attraction to draw and engage visitors on an exhibition stand, side entertainment for corporate events, or fun at parties and receptions. We offer these games for hire across all of the Midlands and much of the United Kingdom. If you have any queries, questions, or would like to hire The Vault for your event please click here to enquire and we will do all we can to help.